First up, is Jim Christy. 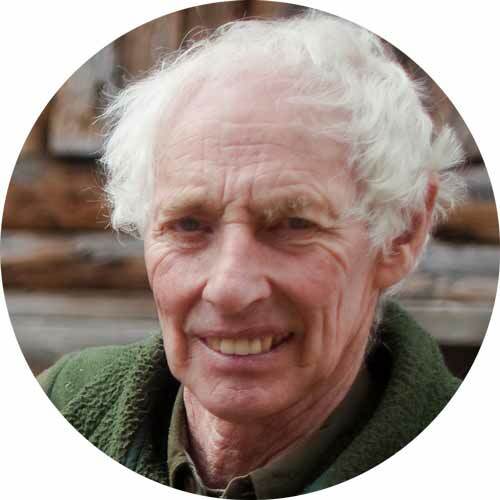 He's the reason we are all here talking about Bristlecone, because back in the 1970s he first began collecting wood up on the mountainside that we've affectionately dubbed "Bone Mountain." You can read a bit more about that piece of history on our "about" page. Jim's specialty is recognizing and adopting beautiful pieces of wood. He has spent most of his adult life in the woods of Southern Colorado, collecting wood and enjoying the forest. Jim has a number of sub-specialties. He studied Physics in college, and today is often found harnessing the laws of physics to lift heavy objects, and perform seemingly-impossible feats using cables and pulleys. There's nothing like the challenge of lifting something heavy to get Jim's creative juices flowing. He recently finished building a new root cellar (his third root cellar during his residence on the property), which involved a lot of rock work and lowering heavy concrete beams across a ravine using cables. I (Laura) took some video of this event and am planning to share it soon. When he's not working with weighty objects, Jim specializes in collecting chicken eggs with his eldest grand-daughter. Ruth Ann & Jim have been married for over 40 years, and they have two grown sons, one of whom is mentioned below. Ruth Ann is a painter who also brings a lot of artistry to cooking amazing food on her wood-fired cook stove. Her French bread is pretty famous, and family friends have been been known to put in a hard day's labor in exchange for a couple of her homemade scones! In addition to painting, whenever she can find the time, she spends her summers growing a beautiful garden, which is quite a feat in alpine conditions. In more recent times she has brought her considerable talents to the job of grand-mothering. 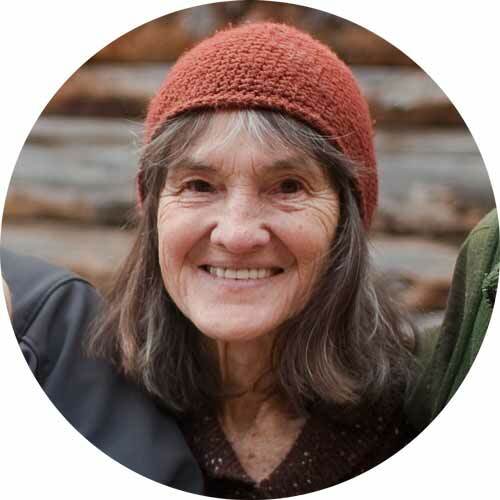 She, too, has been collecting beautiful specimens of wood from Bone Mountain for decades, and has spent the majority of her adult life in the mountains of Colorado, building the Christy homestead and raising all manner of living creatures. Luke Christy is the eldest son of Ruth Ann & Jim. He specializes in Daddy-ing and in understanding the inner workings of all manner of inanimate objects. As a result of having been raised on a remote mountain property, Luke has spent years honing his ability to fix things and figure out how to solve problems. This makes him particularly well-suited to design, construct, and fix solar systems, which is what he does on a daily basis for his "day job" of owning and operating a solar integration business. When Luke was a child, growing up on the Christy homestead, they didn't have access to electricity (except from generators), as the nearest electrical line was many miles away. But in the 1980s, the solar electric (PV) industry began to emerge, and owners of remote properties began to install them . The Christys were early adopters of solar technologies, and Luke grew up building & modifying these systems. Luke was raised alongside the renewable energy industry, so it seemed natural to return to Colorado to start a solar business after a decade of higher education & international gallivanting. When he's not solving his clients' problems, he enjoys the fine art of tinkering and making things, and hanging out with his two young daughters, the oldest of whom is pictured here. Laura Mezoff Christy. That's me. Together with my husband Luke, I'm the founder of Bone Mountain Bristlecone, and writer of this blog. I conceived of the business a couple of years ago while wandering the magazine aisle of a grocery store in middle America. At the time, I was struck by the sheer number of woodworking magazines that existed in a non-descript grocery store, and I thought, "I'll bet there are lots of woodworkers out there who would love to get their hands on the rare Bristlecone that the family has collected." I instantly decided I wanted to find a market for Jim's rare wood collection, and began working toward that goal. The rest is pretty much history. My background is in architecture, entrepreneurship ,and renewable energy. And like the rest of the Christy family I've spent most of my life making things by hand, enjoying the great outdoors, and I am excited to create the opportunity to bring this one-of-kind resource to people who will really love and appreciate it. I am working hard to increase our capacity to bring you our wood, so please have patience and stay tuned! The purpose of this blog is to tell more of the story of the family and their relationship to the rare wood. I'd also love to feature things that people have made with the wood, so if you have made something beautiful with our wood, please contact me, as I'd love to share with our readers.